I love cheese. I could blame the lasting effects of French colonization and its influence on my heritage or it could just simply be that foods taste so good with cheese. I do have dairy cheese in my house, but because of the allergies in my household, I always stock dairy-free cheese. Which one is best? There are so many choices for dairy-free cheese. I know, because I have purchased and tried most of them. I usually buy Daiya’s dairy-free cheese products. They have a variety of styles (shredded, slices, block, wedges, etc) and flavors (mozzarella, cheddar, provolone, etc). 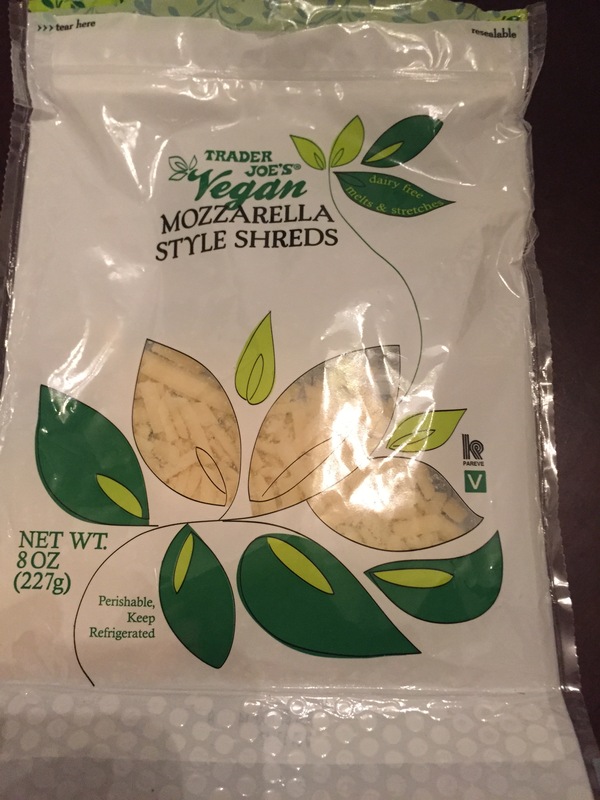 I typically purchase Daiya products at Whole Foods, but when I saw that Trader Joe’s now sells a dairy-free mozzarella shredded cheese for less than $3.50, I was elated! I still buy Daiya products (which are never less than $5), but love the idea that a convenient, cheaper option exists. It was almost hidden. I regularly frequent Trader Joe’s and I am always on the lookout for new and edible products. I even check different Trader Joe’s locations, as they tend to stock based on customer demand. Initially, I always only noticed that they have a soy-cheese alternative block style, but it isn’t dairy-free. It has dairy in it. This dairy-free shredded mozzarella package is located among the other packages of dairy cheese shreds. I use it in a variety of ways like for pizza, manicotti, salad toppings, lasagna, even Alfredo sauce when I don’t have dairy-free parmesan cheese in stock. Enjoy!